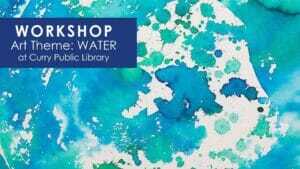 Gold Beach Art Enthusiasts workshop: Water! Gold Beach Art Enthusiasts will be hosting a free art workshop on Saturday, April 13, 2019 at the Gold Beach High School art room beginning at 10:00am. The theme will be Water! Join us for a relaxing and inspiring art event in Gold Beach, Oregon. This will be an informal time to share and create art with the theme: water. Please bring supplies to make art with us. You are invited to bring any artwork you have which could fall within the theme of “water” (ie: watercolor paintings, art with the subject of water, etc) and we’d love to see how you’ve captured or used this beautiful and somewhat elusive element in your own work. You need not share your work to attend. This is a free community art workshop. All ages and artistic abilities are welcome. Some supplies may be available for sharing and we’ll focus the most of our time on simply working on our own art together.